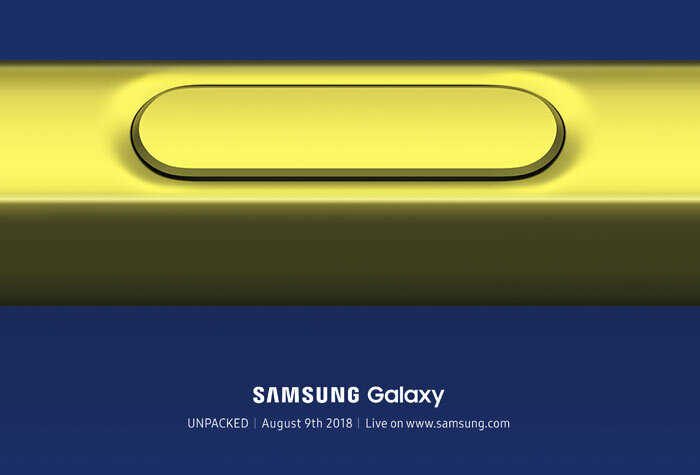 Samsung has shared invites for its upcoming Galaxy Unpacked event on Thursday 9th August, 2018. While the firm isn't explicit about what to expect, it has published an image and a video showing close-ups of a golden S Pen stylus. Therefore one can expect that a new Note device will be launched, likely to be dubbed the Samsung Galaxy Note9. Another set of leaks on Twitter indicate that the S Pen button will be useful for tasks such as a remote shutter button, long range self timer, music control, and other tasks not obviously meant for a stylus. The Samsung Galaxy Unpacked event will be available to watch live on the Samsung global news site, and elsewhere. Samsung is usually pretty efficient at following up with full product pages and videos focussing on all the aspects of new flagship smartphones. I've owned three previous Samsung Galaxy Note handsets so will be watching this launch with interest. Hope they fixed their SoC….